The annual Salon International de la Haute Horlogerie (SIHH) 2017 recently ended on 20 January 2017. As always, the exhibition saw plenty of fantastic, truly innovative pieces from participating luxury watch manufacturers. Among the brands that exhibited were Montblanc, Jaeger-LeCoultre, IWC Schaffhausen, Cartier, A Lange & Söhne, Panerai, Piaget, Girard-Perregeaux, Roger Dubuis and Ulysse Nardin. Of course, there was Audemars Piguet too. 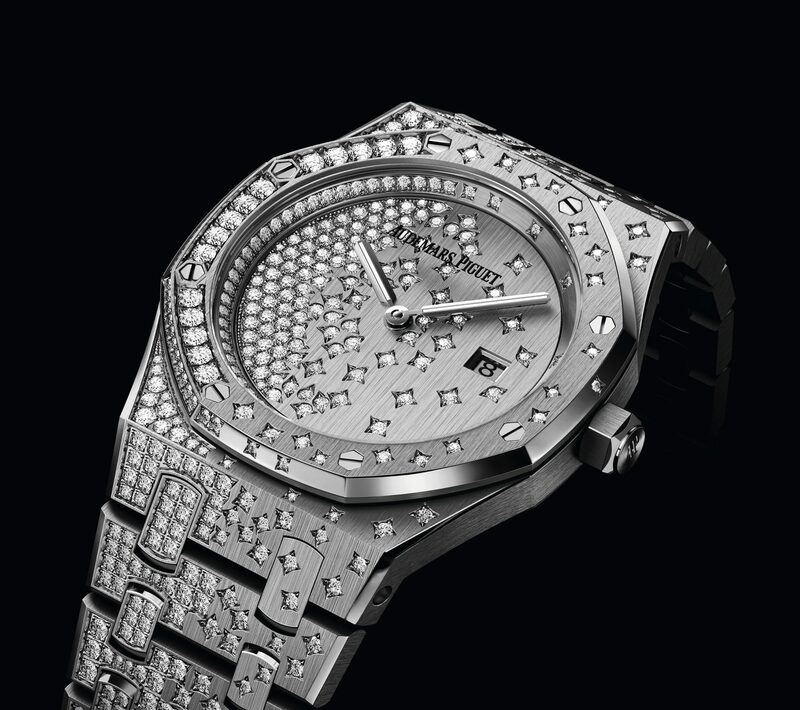 The brand revealed some really breathtaking timepieces such as the Diamond Outrage. As the latter’s name suggests, many diamonds were used to create it. 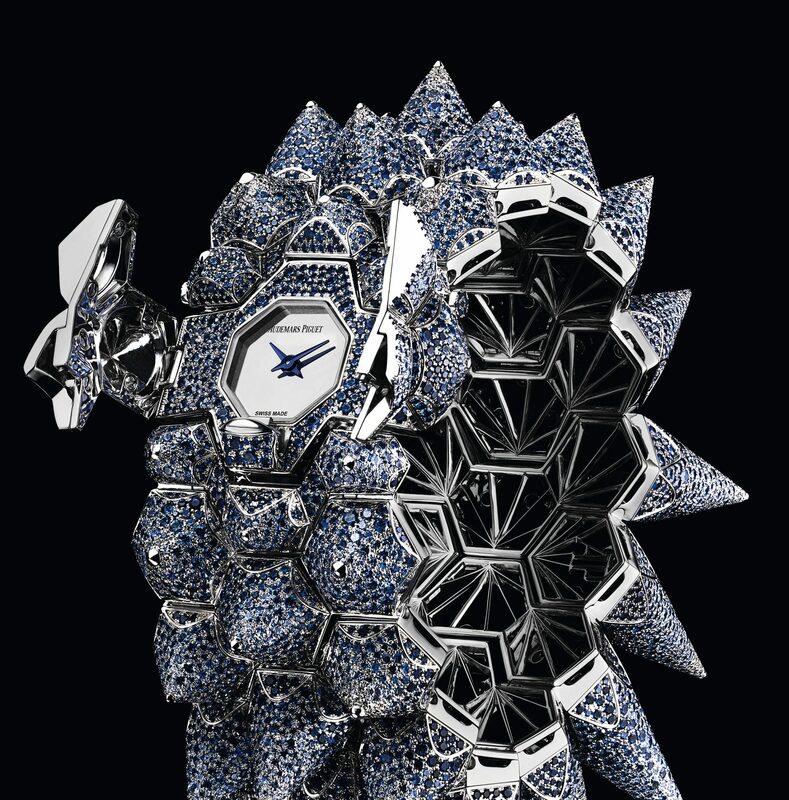 The watch also has a bracelet of spikes made with 18-carat white gold and snow-set diamonds. We were also very much enamoured by several other Audemars Piguet timepieces revealed at SIHH 2017. We couldn’t pick a favourite, but here are our top five choices. We’ve varied our selection to include something for the men, something for the ladies, and some really opulent pieces with plenty of diamonds. Have a look at the five timepieces below, while you can also see the rest of the brand’s SIHH 2017 novelties here. This aptly named watch is the third and final addition to Audemars Piguet’a one-of-a-kind Haute Joaillerie trilogy of timepieces. The first design in the trilogy was the Diamond Punk (2015), while the second was named Diamond Fury, and was unveiled last year. Diamond Outrage in 2017 is, well, a pretty outrageous design for a watch. The spiky creaction is presented in two unique 18-carat white gold pieces either set with diamonds or blue sapphires (pictured here). To create the glittering spikes, a technique called “snow setting” is used. Diamonds are set incredibly close together so that the white gold frame becomes almost invisible. The whole effect is spellbinding, luminous and breathtaking. For an up-close view, click here. 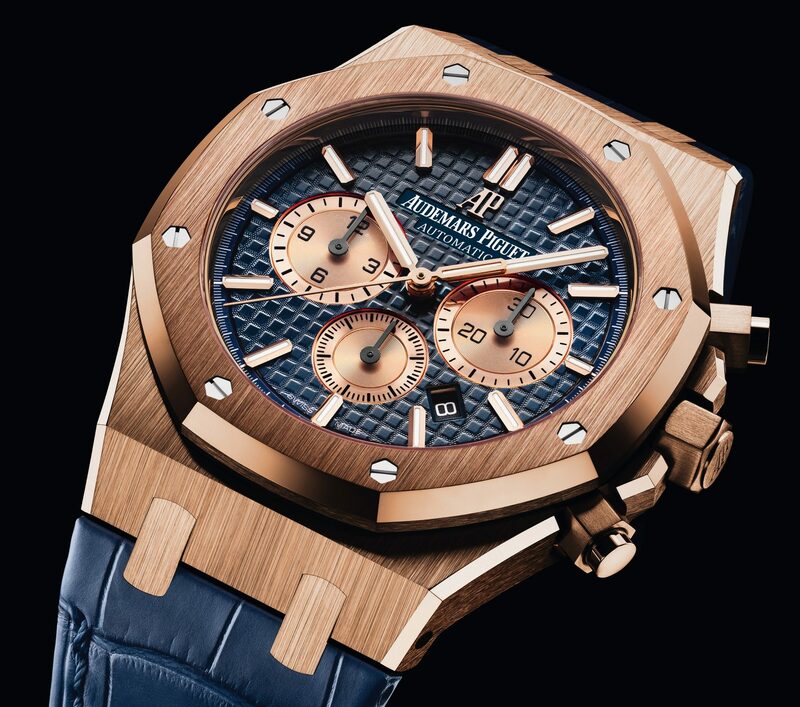 2017 marks the 20th anniversary of the first ever Royal Oak Chronograph by Audemars Piguet. This year’s edition draws inspiration from the vintage examples from the 1930s to 1960s. There are seven models in this new series, all of which feature a new two-tone dial design. The chronograph counters have been made larger with additional luminescent coating applied, while the date window is relocated to between the four and five o’clock positions. The watches are available in an array of finishes — four versions in pink gold with a pink gold bracelet or alligator strap. You also have a choice of having a brown or blue ‘Grande Tapisserie’ dial in black, silver or blue. Take a closer look here. 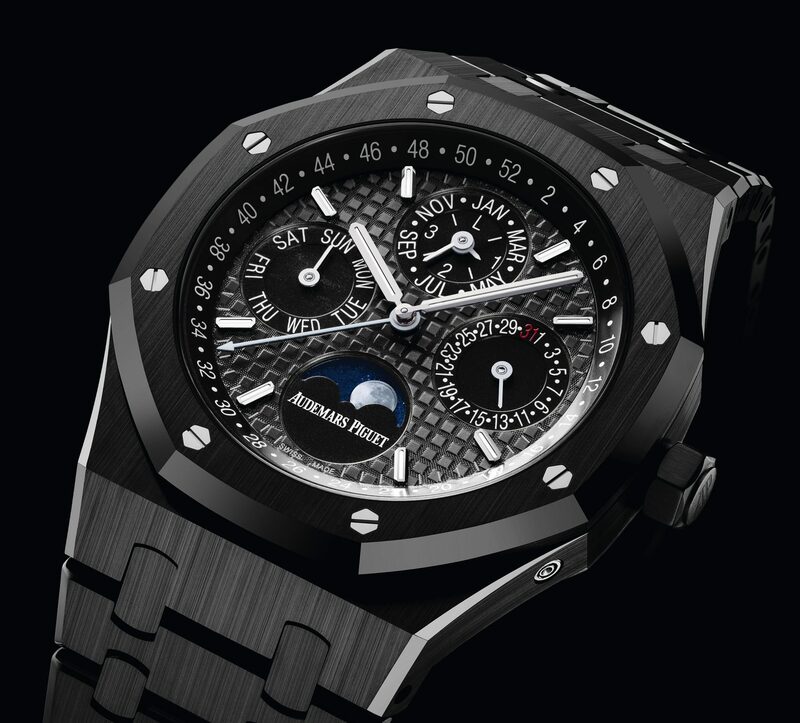 This full black Royal Oak Perpetual Calendar measures 29mm in diameter and has 38 jewels in total. You’ll be able to read the week, day, date, astronomical moon, month, leap year, hours and minutes from this horological novelty. It has a power reserve of 40 hours and the moon phase astronomical indicator has to be corrected every 125 years and 317 days. The case is made of black ceramic, while the dial is slate grey with a ‘Grande Tapisserie’ pattern. It has black counters, white gold applied hour-markers and Royal Oak hands with luminescent coating and a black inner bezel. The watch is also water resistant up to 20 metres. To take a closer look at this beauty, click here. 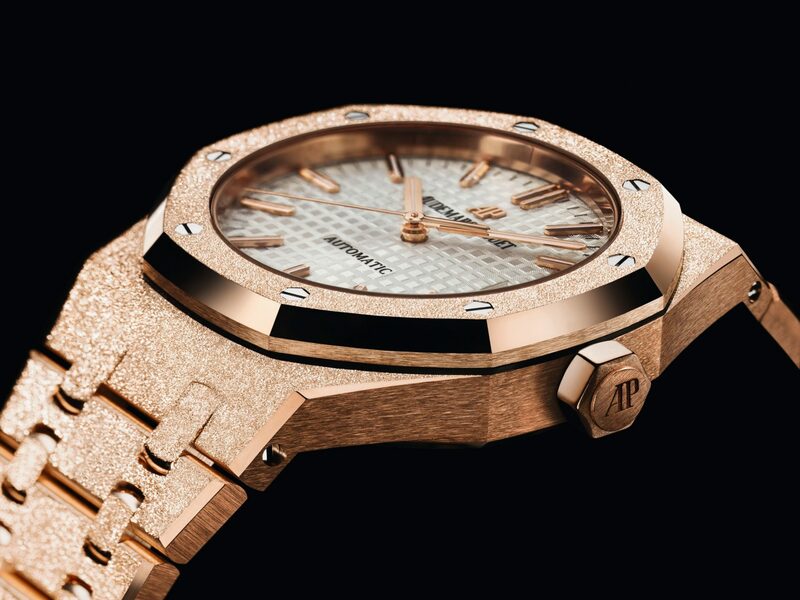 In honour of Royal Oak celebrating its 40th anniversary for its women’s selection, Audemars Piguet unveils the new Royal Oak Frosted Gold. Created in collaboration with Florentine jewellery designer, Carolina Bucci, the contemporary design is available in white gold and pink gold. The bezel, case and bracelet in shimmering hammered pink gold houses a 40-jewelled self-winding movement. The dial is of the Royal Oak’s symbolic silver-toned ‘Grande Tapisserie’ design, and has pink gold applied hour-markers and Royal Oak hands with luminescent coating. It has a power reserve of 60 hours and is water resistant up to 50 metres. If you’d like a closer look, click here. A total of 429 brilliant-cut diamonds of approximately 2.56 carats adorn the case and bracelet, while just the dial has 112 brilliant-cut diamonds of approximately 0.67 carats. The dazzling dial is made of 18-carat white gold and matching white gold Royal Oak hands with luminescent coating. Similarly, the bracelet is also made of 18-carat white gold and features an AP folding clasp. The watch is water resistant up to 50 metres, while its 33mm case is perfect for embellishing slender wrists. For an enlarged view of the diamond-set case, click here.